It provide[s] a thorough and flexible set of teaching texts for a senior undergraduate course on documentary film. Originally released in 1998, Documenting the Documentary responded to a scholarly landscape in which documentary film was largely understudied and undervalued aesthetically, and analyzed instead through issues of ethics, politics, and film technology. Editors Barry Keith Grant and Jeannette Sloniowski addressed this gap by presenting a useful survey of the artistic and persuasive aspects of documentary film from a range of critical viewpoints. This new edition of Documenting the Documentary adds five new essays on more recent films in addition to the text of the first edition. Thirty-one film and media scholars, many of them among the most important voices in the area of documentary film, cover the significant developments in the history of documentary filmmaking from Nanook of the North (1922), the first commercially released documentary feature, to contemporary independent film and video productions like Werner Herzog's Grizzly Man (2005) and the controversial Borat (2006). The works discussed also include representative examples of many important national and stylistic movements and various production contexts, from mainstream to avant-garde. In all, this volume offers a series of rich and revealing analyses of those "regimes of truth" that still fascinate filmgoers as much today as they did at the very beginnings of film history. As documentary film and visual media become increasingly important ways for audiences to process news and information, Documenting the Documentary continues to be a vital resource to understanding the genre. Students and teachers of film studies and fans of documentary film will appreciate this expanded classic volume. Barry Keith Grant is professor of film studies in the Department of Communication, Popular Culture and Film at Brock University in Ontario, Canada. A Fellow of the Royal Society of Canada, he is the author or editor of numerous books, including Voyages of Discovery: The Cinema of Frederick Wiseman, 100 Documentary Films (with Jim Hillier) and Shadows of Doubt: Negotiations of Masculinity in American Genre Films (Wayne State University Press, 2011). Jeannette Sloniowski is associate professor in the Department of Communication, Popular Culture and Film and the graduate program in popular culture at Brock University. Her publications include Canadian Communications: Issues in Contemporary Media and Culture, Detecting Canada: Essays on Canadian Detective Fiction, Candid Eyes: Essays on Canadian Documentaries, and Slippery Pastimes: A Canadian Popular Reader. Strongly recommended for students and scholars at all levels. A gold mine for teachers and students and in many disciplines—as both reference and text book. If I was suddenly asked to teach a History of the Documentary class and told that my budget would allow for the use of just one textbook, Documenting the Documentary: Close Readings of Documentary Film and Video is the one I would select. . . With this book as our guide, we will come out at the end of this exploration with "a profound appreciation of the aesthetic complexity of the documentary form." This volume arrives as a genuine gift. Anyone seeking to study the subtleties and complexities of the documentary film will want to see as many of the best examples of this form as possible. And anyone who sees a good range of outstanding examples will want to know what others who have taken the time and effort to examine them closely can reveal about why they possess the power and fascination that they do. This new and expanded edition of Documenting the Documentary gathers together an exemplary set of essays that do exactly that. It is a great boon to teacher and student alike. 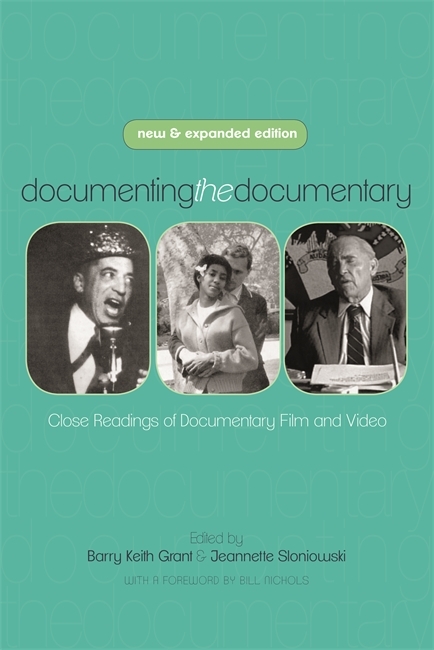 The extremely broad range of documentary films and videos—from Nanook of the North to Paris Is Burning—makes this an extremely useful and instructive text for several communication courses. There is something for everyone in this text. . . . A complex collection of critical essays, a wonderful reference text, and an enjoyable read for the cinephile.